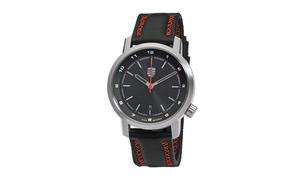 911 Essential Watch edition in Silver. Swiss Ronda movement with one jewel. Waterproof casing made from toughened aluminium. [ 10 ATM ]. Screw-down base and crown. Crown and tube made of toughened stainless steel. Engraving on base with serial number. Mineral glass with sapphire coating. Black dial with Porsche Crest and Red details. Includes one leather strap and two fabric straps with quick-change mechanism. 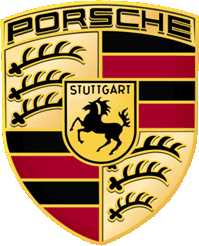 Stainless steel pin clasp with 'PORSCHE' engraving. Diameter: 43 mm.